If heiress/pop-culture diva Paris Hilton was exhausting her 15 minutes of fame in ancient Rome, her ladies-in-waiting would be serving her dishes flavored with saffron threads - the most expensive spice on the planet - while the rest of us might garnish our mere-mortal plates with calendula (Calendula officinalis, often referred to as the "pot marigold" or "poor man&apos;s saffron"). 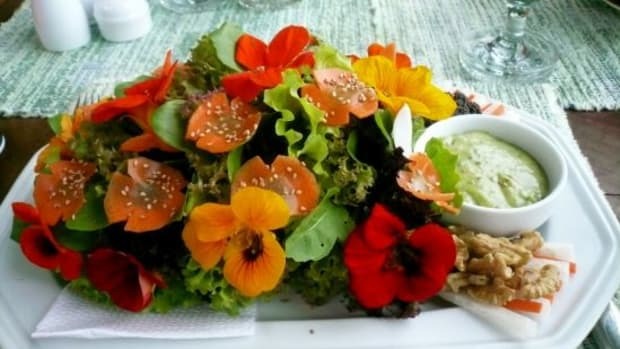 Edible flowers have been used in international kitchens for thousands of years. You can grind them into a powder, to be used as a spice, or adorn an elegant dish with brilliantly hued petals. 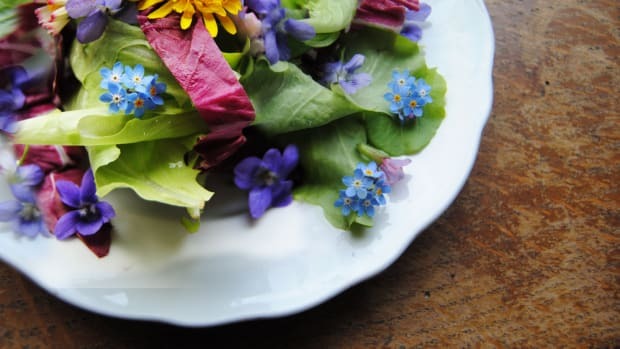 Purchase edible flowers at an organic market, spice store, nursery or farmer&apos;s market, or start an organic gardening project that brightens your backyard. You can search for an organic farmer&apos;s market in your area through Local Harvest or for a nursery through Plant Search Online. 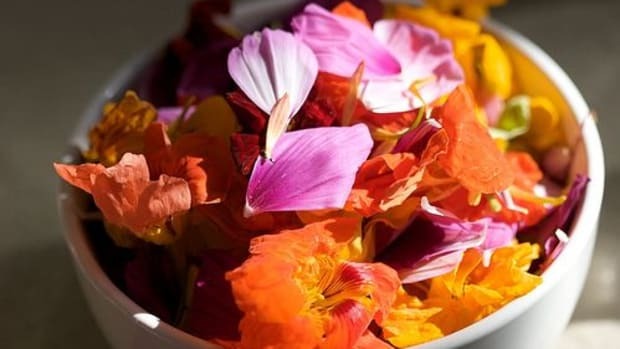 According to OFA-an Association of Floriculture Professionals, the top 10 edible flowers are calendula, chives, daylily, mint, nasturtium, pansy, rose, sage, signet marigold and squash blossoms. Other favorites include chrysanthemum, dandelion, hibiscus, honeysuckle, lavender, sunflower, tulip and violet. 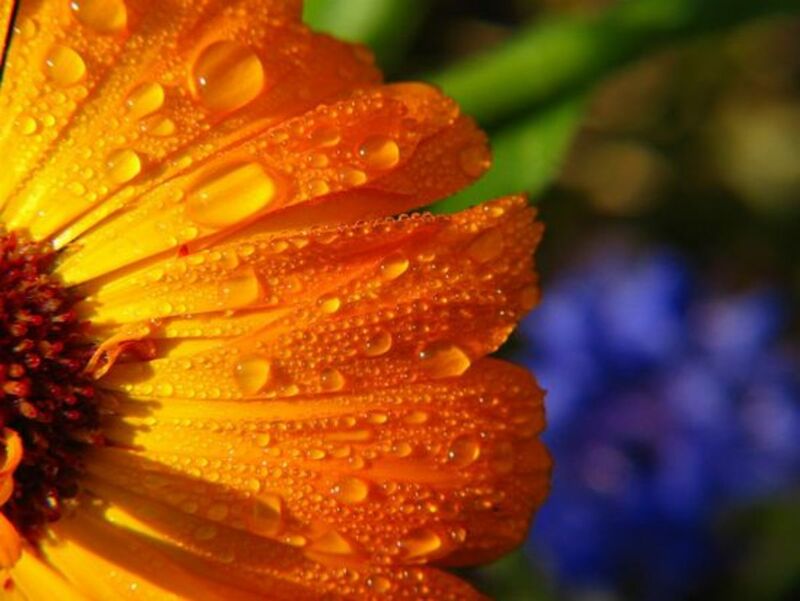 Summer is an ideal time to begin organic gardening, and calendula - a hardy annual that produces orange or yellow flowers on a long stem - is one of the easiest edible flowers to grow, according to Jennifer Urezzio, founder of Blooming Grove Herbal Remedies. height of the plants is 24 inches, and they like well-drained, light, sandy soil and full sun. Start the seeds now. By mid-summer, they will be blooming. Cover the seeds lightly with Ľ" of organic garden soil. They sprout and grow quickly. Make sure you place them in an area where you&apos;ll want to see them year after year because these plants will drop their seeds. I have grown these flowers in pots, as well. Water them once or twice a week - more if the weather has been dry." Calendula petals have a zesty or peppery flavor, according to Urezzio. "You can use them in soups or rice dishes," she says. "They work wonderfully if you&apos;re making herb butters or salads. 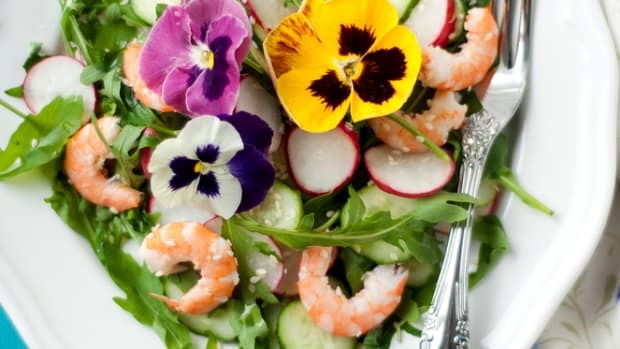 The petals will add a yellow color to the dishes." 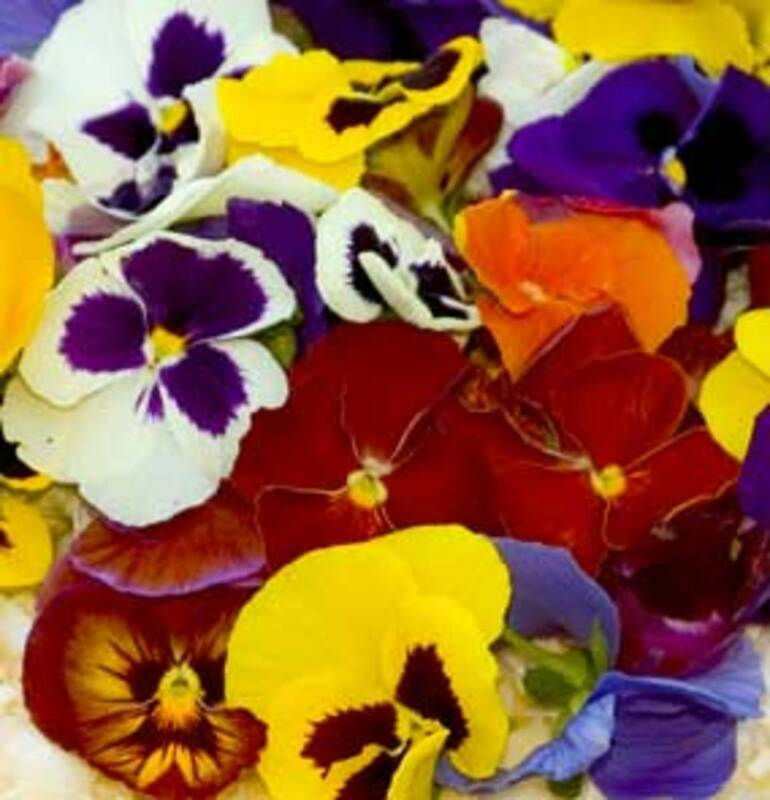 Gather violets (Viola odorata) and garnish deviled eggs, says Dr. Ty Harrison, a professor and chair of the Biology Department at Westminster College in Salt Lake City, Utah. 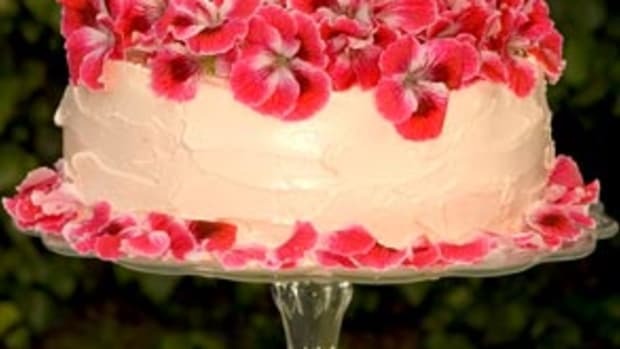 He adds them to lemon gelatin and green salads, and "they can also be candied with egg white and sugar to decorate cakes and desserts," he tells OrganicAuthority.com. "My wife and I grow the common showy milkweed (Asclepias speciosa) in our backyard to make milkweed-flower fritters," he adds. "Small clusters of milkweed flowers are picked at their peak in early summer. We dip them in a light batter and deep-fry them for a few seconds until light brown and crisp. Sprinkled lightly with cinnamon and sugar, the delicate fragrance of the milkweed flowers can be detected, along with the crunch. I pickle the young, 1" milkweed pods and use them as capers or hors d&apos;oeuvres. Our milkweed made it into our yard by itself, but it could be easily transplanted from the wild." says. "There are a lot of good organic soils on the market today. I suggest checking with your local garden store." 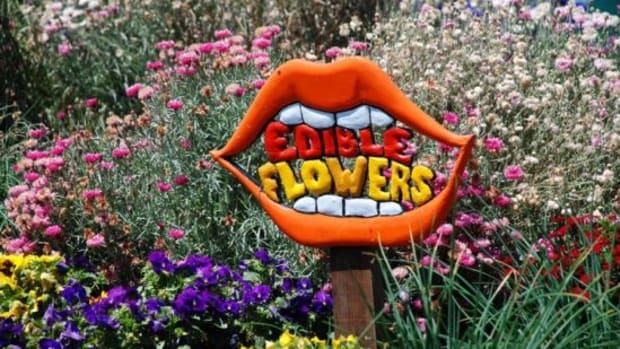 One last note of caution: Never eat flowers unless you are sure they are edible. 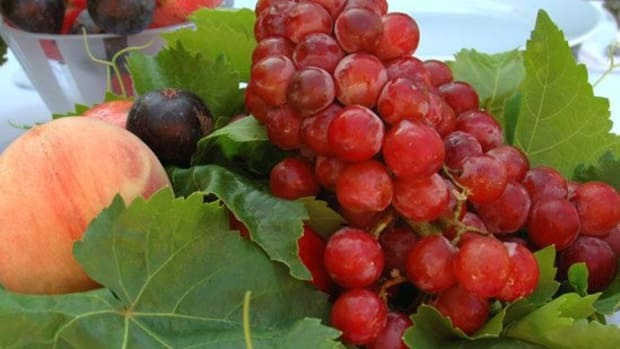 A useful list, along with safety tips, is available from the Ohio Department of Agriculture. 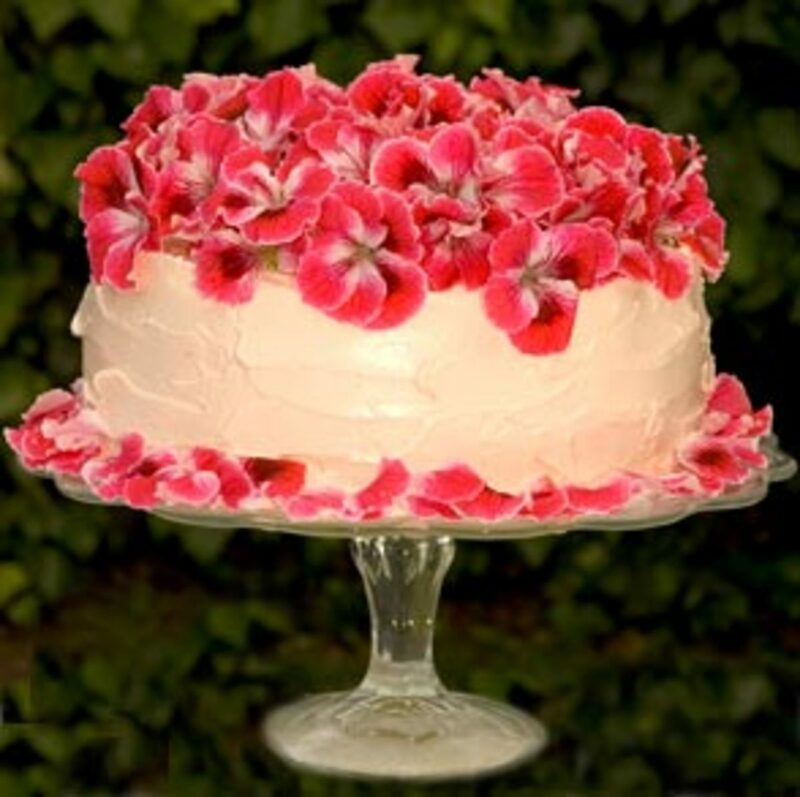 Read more about in season edible organic flowers in our Farmers&apos; Market Report Also see our recipe for our Gorgeous Edible Organic Flower Cake (seen in the photo above).